We live in the era of information workers — people, who’s daily job revolves around receiving and processing the information. According to some researches around 40% of workforce in North America is information workers. Most of the information comes in the form of documents and the most popular document format is PDF. The most common way of handling PDF documents and forms is using InfoPath and SharePoint. However, few years ago Microsoft has announced InfoPath retirement, which caused a lot of discussions about InfoPath alternatives. Even if later Microsoft reviewed their plans and promised to keep product alive till 2026, it is not the best idea to start using InfoPath today. Of course you can continue if you already use, but it is still not a bad idea to start looking for an InfoPath alternative. 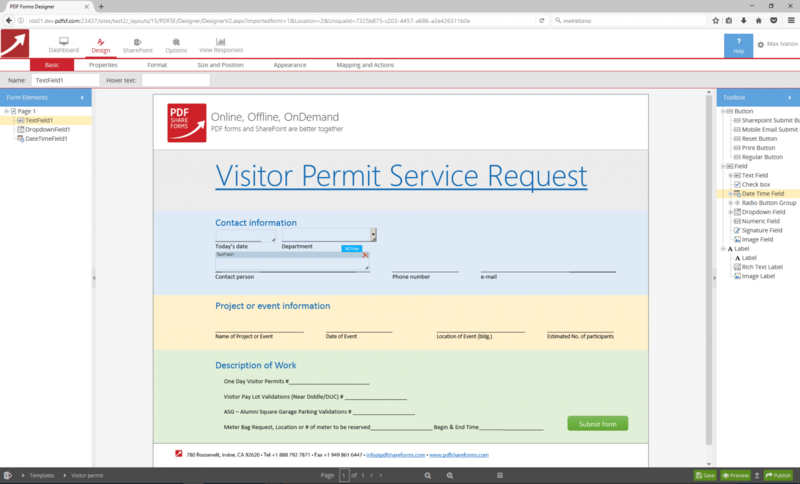 PDF Share Forms provides an extensive range of tools allowing you to create a form in SharePoint. Last, but not least, PDF form can be digitally signed. As opposed to most other form types, PDF form is really easy to create. 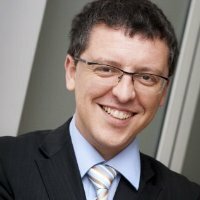 You do not need to have deep technical knowledge or specific IT skills. It is not complicated at all. First of all, in order to create a good-looking and functional form it is important to think of its structure. Most forms are logically split into horizontal sections and can fit on one page. However, knowing the environment where you are planning to use these forms (mobile, widescreen, 4:3 displays) you can develop custom fit to screen solutions. The whole process starts with a designing of a form or converting an existing document into PDF file. We used Microsoft Word to demonstrate for this example. This Word document is a base of a future PDF form. To create a form, think about design and layout, put your branding elements and make placeholders for the form fields. When it is all done save this document as PDF. Interactive elements, like fields and buttons, we will add later. Form without fields is a simple document with no interactive elements. So, next step is to add functionality to the new form. You can do so by using Adobe Acrobat software. In order to create a fillable form fields you need to go to the “Tools” section and choose “Forms”, than choose” Create”. Acrobat asks how would you like to create a form. In this case we are going to choose “From existing document” option. Browse for the PDF file you saved a bit earlier if it is not open in Acrobat already. To add form fields choose “Add New Field” from the menu. There are many types of fields in the drop down menu, pick the most suitable for your form. However, all this functionality is available only in full Adobe Acrobat version which requires additional expenses on license. PDF Share Forms Information Worker has its own out of the box PDF Designer with similar abilities and intuitive interface. 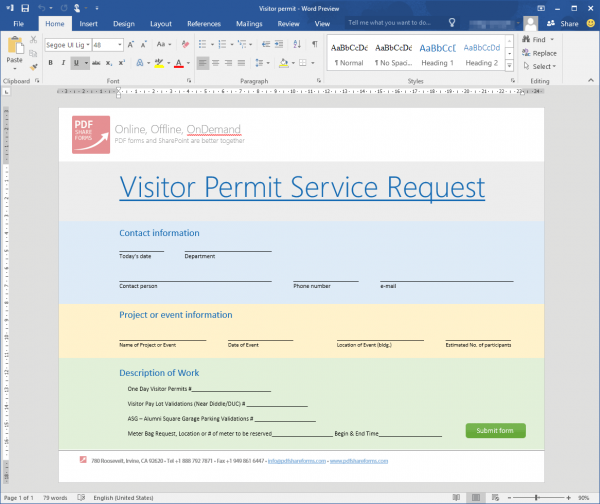 Using PDF Designer you can create a form from scratch or add interactive elements simply by dragging and dropping them to already existing document. PDF Share Forms provides you with an easy way to make corrections to the forms. For example, if there is a need to rearrange fields in the form or allow more space for a certain field, all you need to do is to make adjustments to original Word document, save it back to PDF and use “Upload PDF background” feature. It replaces old PDF form (as a background) with a new one, keeping all interactive elements on their places. When it’s done you just need to make sure that fields and their placeholders fit to each other. The process of deployment in PDF Share Forms is also intuitive. The software guides you through the menu, where you can get a published form, define e-mail distribution options or download a form template to publish it online. After deploying the form as a Content type you can create a new form instance in the SharePoint library by selecting New Document menu. 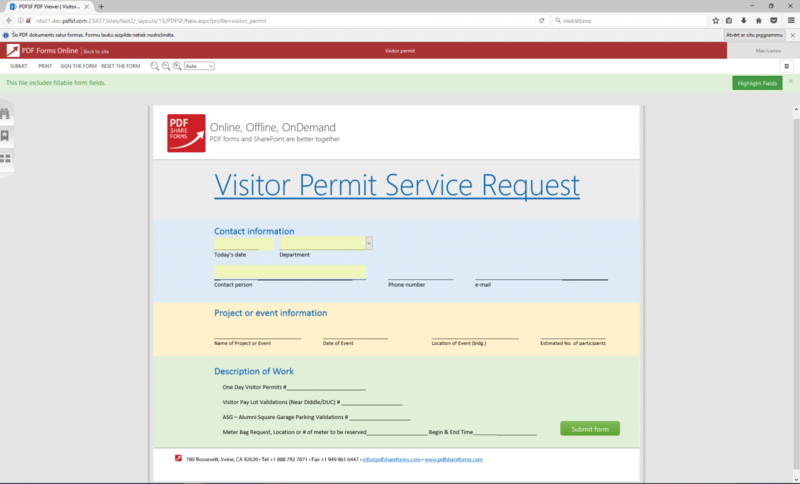 Once you have created a new form instance, it opens using PDF Share Forms PDF Viewer. Smart Viewer Selector allows you to choose between browser based viewer or external stand alone program, like Adobe Reader. Browser based PDF Share Forms Viewer is a powerful PDF document viewer and form filler. You do not need to install any third party software to work with PDF documents within your SharePoint environment. This truly cross-platform browser based PDF viewer allows to run your business tasks on virtually any device, be it Android or iPhone, tablet or phablet, desktop or remote server connection. Every next document you submit saves and synchronizes automatically with SharePoint library – PDF Share Forms pulls form field data from the form and saves it in SharePoint columns. Forms are also stored in the same library as files. You are also able to download a template copy and use it for e-mail distribution or publishing on a web site, so external users can fill it and automatically send you the information. Consider replacing InfoPath with PDF Share Forms. PDF Share Forms Information Worker fully supports attachments. Flexible configuration of the product allows defining attachment formats, quantity and size e.g. one document, only .jpeg and .png image files that are less than 2MB. This can be a scenario where the user is required to attach a picture of his or her driver’s license for example. Validation rules can be also applied to prevent the submission without attachments. Attachments also work on mobile devices. Ideal solution for field workers to make on-site surveys and reports with photos from mobile devices as attachments e.g. traffic incident reports or health and safety checks at building sites. PDF Share Forms Information Worker brings true cross-platforms experience. You can view and fill forms from your smartphone, laptop or tablet just the same way as you do on your computer. All you need is the Internet browser on your mobile device. PDF Share Forms Information worker support iOS, Android and Windows mobile devices. Take your forms with you! PDF Share Forms Information Worker allows you to be productive even when you are offline. Save the form that you are going to use offline locally and you can fill it in and submit at any time. Email submission functionality keeps forms submitted offline in the Outbox of your email client and sends them to SharePoint when the Internet connection is restored. Ideal solution for field reports and surveys in areas with poor or non-existent Internet connection. 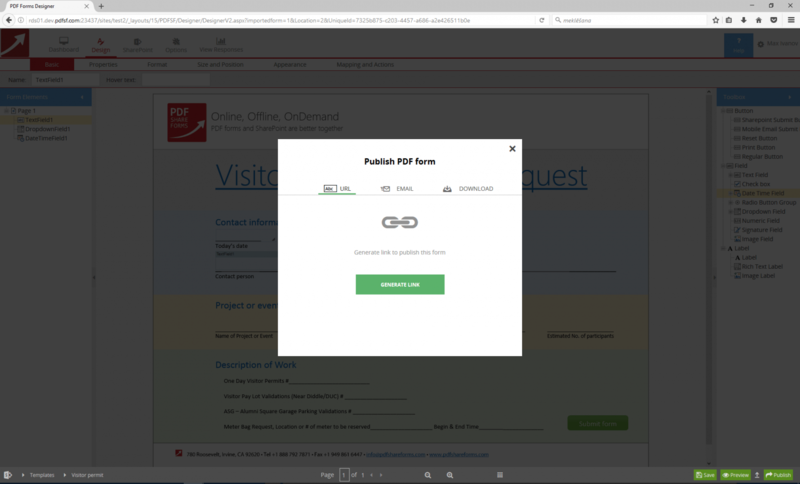 PDF Share Forms allows external users that do not have access to SharePoint environment to submit forms anonymously. Gateway submission is a unique feature of PDF Share Forms that allows anonymous users outside of your environment to submit forms directly to your SharePoint without compromising security. Ideal solution for public surveys or request forms for websites. Submission via e-mail allows anonymous users outside of your environment to submit forms using any electronic mail to your SharePoint. E-mail submission also works offline that makes it a great choice for field staff that has limited access to the Internet. Forms Stages functionality allows splitting the form life-cycle into several logical pieces and making certain parts of the form accessible only in a certain stages. For example, an HR form that has two parts – one for a potential employee and one for the HR manager. When the form is opened for the first time it is set to stage 1 and only the fields that are mean to be completed by the employee are available. When the form is submitted, it is set to stage 2 and all the fields that were filled in the first stage are locked to prevent changing the data.